As Lebanon’s youth continue to demonstrate, there has been limited support from the general population. Do ordinary Lebanese really want to change the political status-quo? “There is hope.” The words were written on the placards and shouted in the crowd. These were Lebanon’s demonstrators, the same ones who months before had been chocking on tear gas shot at them for expressing their opinion. This most recent protest movement started in July with the “Trash Crisis” that left Beirut’s streets lined with rotting trash. Since then the movement’s goals have evolved: in addition to finding a solution to the trash issue they are demanding a comprehensive social security system, an end to government corruption and an effective policy for looking after refugees. Although the protest movement is made up of many different groups and opinions, there is a strong commonality between them; most are young and middle class. “You can smell it right? This is life.” A stray cat jumped from the trash pile flowing onto the pavement, causing a half soggy cardboard box to land at Mahmoud’s feet. The stench was overwhelming. “It’s very hard to live in this area. They [the government] take care of drugs, but that’s it.” It was a stark contrast to Beirut’s affluent and spotlessly clean downtown. Here, the trash issue lingered on. Mahmoud was not yet a protester, and neither are the majority of Beirut’s residents. One question that springs to mind is: why do so many people who are affected by corruption and trash not protest? In the mainly Sunni suburb of Tariq el-Jedide, people are restless with the government, but have so far not joined the protests en masse. Almost every week there are new stories of ministers and high-level government employees taking government money and spending it on property and lavish lifestyles. This comes at a time when national unemployment is at 24%, and youth unemployment at 35%. However this is not yet manifesting itself into widespread action supporting the protest movement. “Corruption? Trash? Phewt!” Jihad’s spit made a clean splat on the pavement floor. “I just want to work”. Support from people here is something that the movement lacks. Its failure to change the policies of the government is partly because it is a movement drawn from one demographic. Despite this, peoples’ perception of the protests from poorer suburbs is one of reserved support; not directly supporting the movement, but in favor of addressing the issues the movement has brought up. The road narrowed as we walked through Shatila refugee camp, its home-made electricity system hung overhead like a tangled net. The Syrian and Palestinian refugees here have little in the way of legal protection in Lebanon, especially when it comes to involvement in politics. They are also largely marginalized by the state. The problems the protest movement is fighting can be seen most acutely in the camps, especially the lack of social security and the abundance of trash. It lined the side of the road along with month-old sludge that made the street smell toxic. “Whatever they achieve, it will not include us.” Iman is Palestinian. She and many others like her have lost all hope in a future in Lebanon, with or without the success of the protests. Palestinians are not allowed to work or own property, despite even their parents having been born in Lebanon. Her hope now is to try to get to Europe; most of the people in the camp seem to have the same idea. There is an acute lack of trust in the protest movement from refugee communities in Lebanon. Many believe that as soon as the movement has any influence they will become corrupt just like the other politicians that have come to power. They are also very aware of the sectarian nature of Lebanese politics, where a certain quota of parliamentary seats is given to each Lebanese sect (in total there are 18). Any kind of permanent solution or citizenship for the refugees could radically change the population ratio of some sects, especially as the majority of Palestinian and Syrian refugees are Sunni. The uprisings that swept across the Arab world have brought momentous change, but with it huge instability. The civil war in neighboring Syria is a constant reminder to people here of the unintended consequences of trying to change the status-quo. 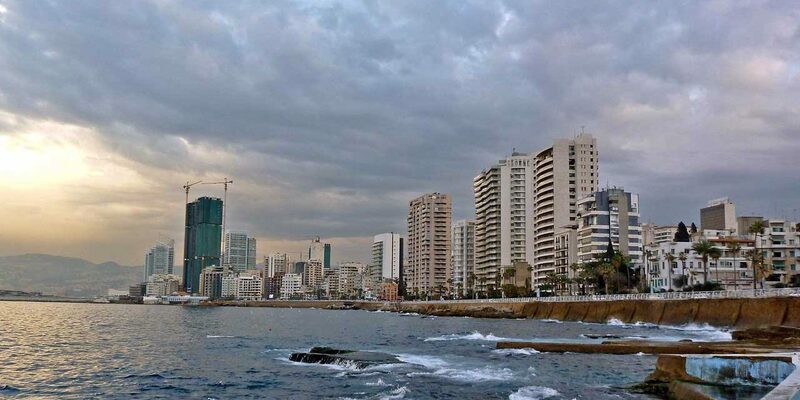 Fifteen years of war in Lebanon brought the country nothing but ruin, and many residents here are understandably cautious when it comes to political change. Despite Lebanon’s deteriorating economic situation, coupled with a corrupted elite, the fear of war has kept many from openly protesting. For now the demonstrations are continuing and there is still limited optimism that their demands will be addressed. There is a strong aspiration amongst Lebanese for gradual political change, thus far. Let us hope that those in power do not ignore them.